This entry was posted in "Four legs good", Single Note Exploration and tagged Bee's Bliss, Charles Brosseau, Cotton Flower & Mimosa, Elizabeth Arden, Fleurs d'Ombre The Poudree, Green Tea Mimosa, mimosa perfume, Sonoma Scent Studio, Yves Rocher. Bookmark the permalink. Woo hoo! I was going to ask how do you like the shower gel and now you answered my question. So happy that it’s a hit for you and it’s even better that it’s available in The US now. You’ll be able to buy more if There is a need. Thank you, Lucas. I’ll keep in mind your offer if I decide to go for the bottle. I do love mimosa perfumes, especially the Jo Malone you introduced me too. What an inspired idea to add cardamom. I associate the flower with Mardi Gras festivities along the promenade in Nice, from when I lived in the area as a student. Those toiletries with a mimosa note also sound lovely. Sabine sent me a couple of mimosa perfumes, which are in my sample box awaiting further trials. Today could be the day! Spring is just the right time to test mimosa perfumes.Who knows – you might find other ideal combinations. Luckily for you, Mimosa & Cardamom seems to be in the permanent collection now – so you can buy it one day when your “no-buy” is over. 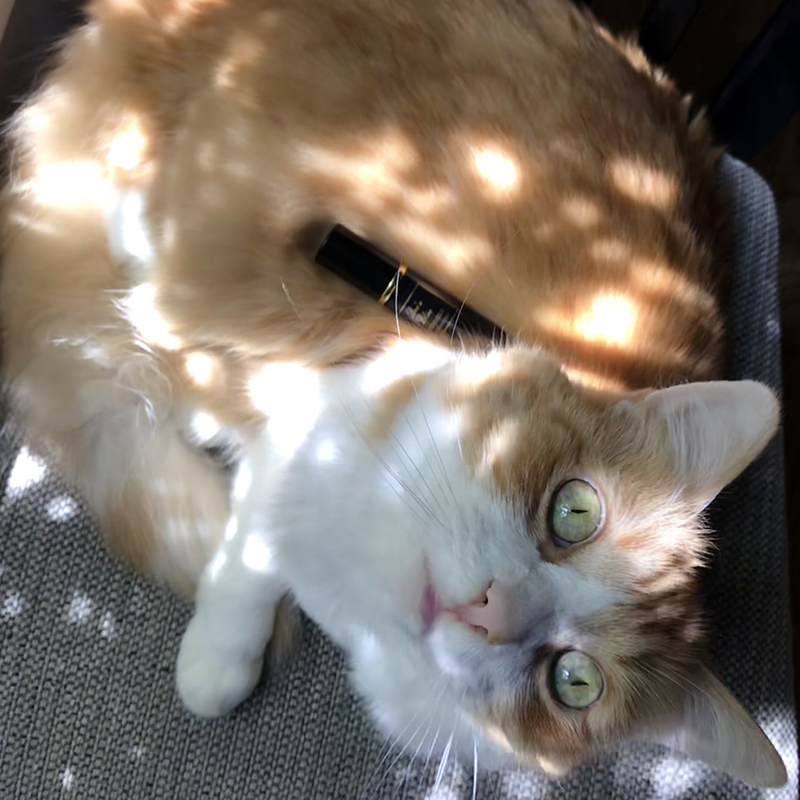 I am not a mimosa fan, but I love all the handsome Rusty pictures! My favourite spring flower in California is jacaranda. In Montreal it is lilac. Until today I’ve never heard of jacaranda. I looked it up in Wikipedia – and I still do not recognize it. I don’t think I saw it around here. Maybe it’s South Californian tree? But I do like lilac. Though, unlike mimosa, lilac note in perfumes isn’t naturally obtained. Wow, has Rusty ever looked more like a supermodel than he does in these photos? He has the moves, he has the eyes! That 2nd photo is star quality. If you ever need Opus III, I have a spare official sample in the original formulation – just whistle! Now, you have definitely piqued my curiosity. I’ve only smelled mimosa maybe once or twice in a fragrance. I can’t say that it grabbed my attention… but I intend to look out for it. 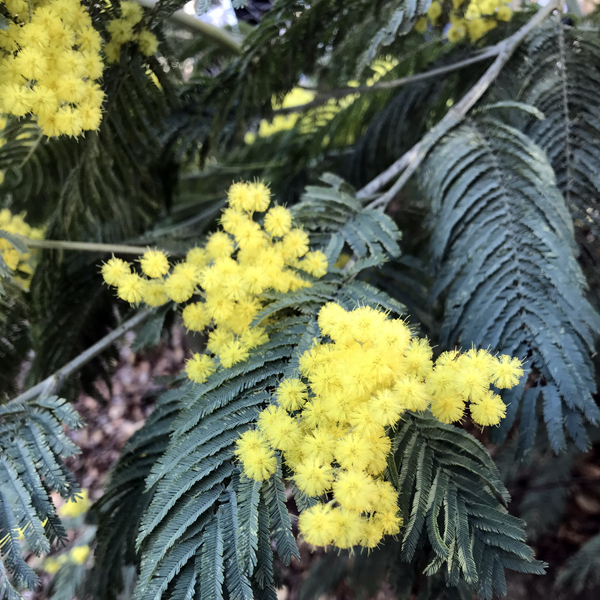 Mimosa is an interesting ingredient: it is a natural “filler” for floral perfumes (and you can find it in several Guerlain perfumes, Chanel, Caron and newer niche lines). On its own, in my opinion, mimosa is too simple. But in the right combination it can be very pleasant. If I were to recommend just several perfumes to try first to get an impression about mimosa-centric perfumes, I’d mention my personal favorites Frederic Malle Une Fleur de Cassie and Jo Malone Mimosa & Cardamom (if you have any reservations about this brand – keep them aside for this perfume). 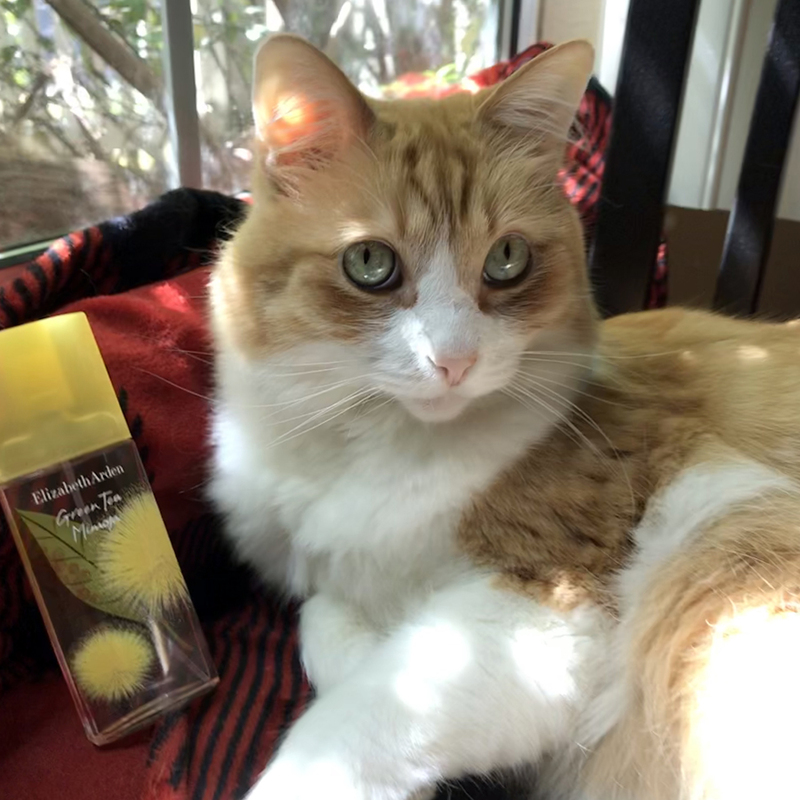 L’Artisan Parfumeur Mimosa pour moi is one of the first that most would mention, though for me it’s far from my favorite mimosa. Thanks Undina! I walk by a Jo Malone counter at least twice a month so I’ll check it out. Now that I think of it, I think the local l’Occitane counter has Mimosa Eau de Parfum. Thanks for the mention, Undina! It was truly by chance that I was at Marshall’s and I couldn’t believe my eyes when I saw Green Tea Mimosa amongst all the Green Tea Cherry Blossom (which was taking more shelf space 6 weeks later). I’m glad it worked out. Ah, and where did Rusty learn the beefcake poses? PS: I must have not paid attention to the difference between mimosa and immortelle. So, just based on name alone to identify the note in a perfume, Prada Infusion de Mimosa is my favorite mimosa perfume. I don’t think I’ve ever smelled immortelle blossom, but I think those are very different plants/scents (though they look kind of similar on a picture from afar). Prada Infusion de Mimosa is very pleasant, I agree. I think Rusty almost grasped the idea of being rewarded for posing: sometimes I can keep his attention by saying the word “treat” – which he learned already. Mimosa is in one of my favorite Spring scents, Shiseido’s Zen (dark bottle with gold etching), I adore it’s green spicy floral notes of galbanum, hyacinth, carnation, orris root and mimosas – it’s so powdery and beautiful.. 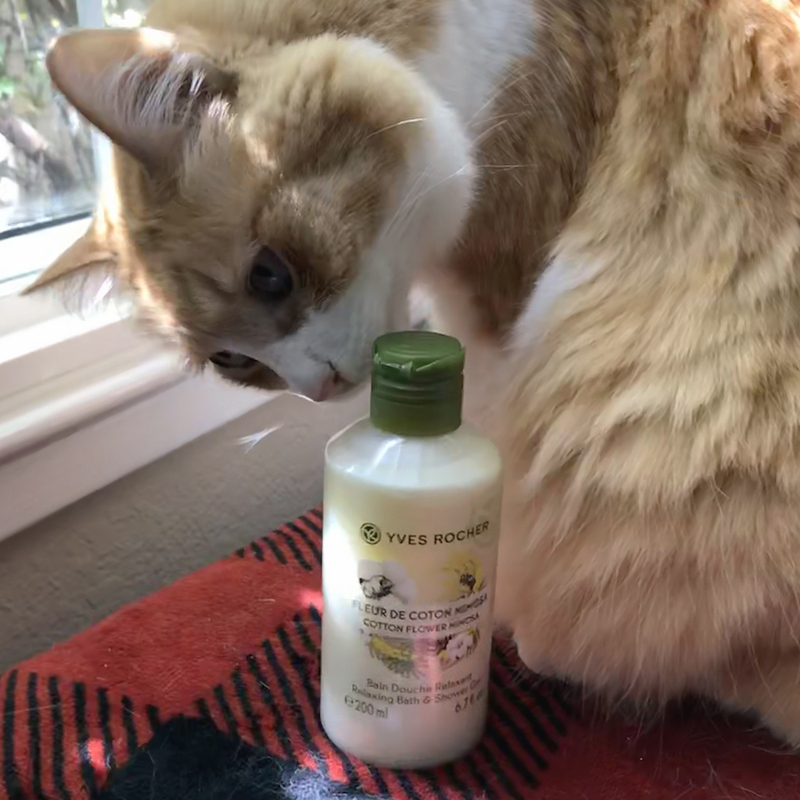 Thanks for the recs on the Yves Rocher shower gel Cotton Flower & Mimosa. I just ordered two bottles! I saw the bottle but I had no idea it had all those notes! Other than hyacinth (which I do not mind, just don’t feel one way or other about it), I love all the notes you’ve mentioned. I also have the “Cotton Flower Mimosa” bath&shower gel and it really smells like mimosa to me. I wish the whole scent were more intense because I can barely feel it. Not great but not bad either. I want to ask you about “Green Tea Mimosa” by Elizabeth Arden: how much of a mimosa scent is it? Does it reach at least the Yves Rocher scent or is the mimosa more of a subdued note? Welcome to my blog, Roxana. Compared to Yves Rocher’s shower gel, Grean Tea Mimosa is a mimosa perfume bomb. But unless you’ve already have or tried other mimosa-centric perfumes, I strongly recommend to start with something else because, while I think it is nice, I don’t think it is the best possible representation of this note in perfumes. Out of those that you can get easier access to now: the three that I recommended to Normand above and Prada Infusion de Mimosa. Yes, I read the other comments and I see many possibilities of a mimosa perfume. I think I will try the Arden’s mimosa for the time being and go from there on. I love a good mimosa, Undina. Apart from their scent, they are such striking-looking flowers. Glad you got Elizabeth Arden Green Tea Mimosa as a gift. I mentioned this one on my blog a while ago. Such a cheap and cheerful take on mimosa.